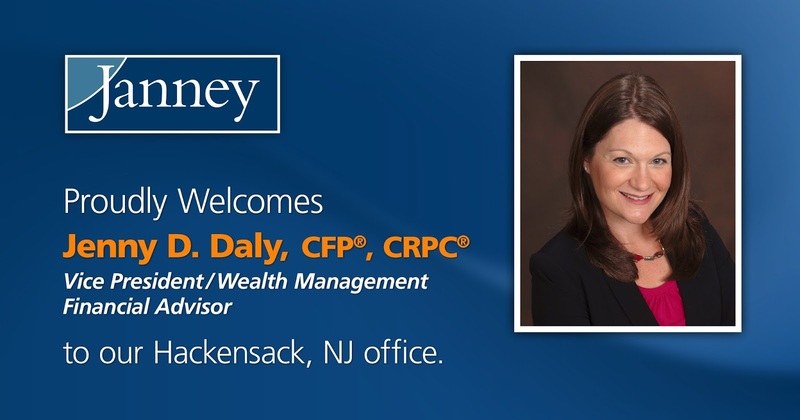 PHILADELPHIA, PA – October 23, 2017– Janney Montgomery Scott LLC (“Janney”), a leading full-service wealth management, financial services and investment banking firm headquartered in Philadelphia, PA, announced that Jenny D. Daly, Vice President/ Wealth Management has joined Janney’s Hackensack, NJ branch office. Daly was previously affiliated with Merrill Lynch. A 17-year industry veteran, she is entrusted with over $90 million in client assets. Daly has achieved the advanced designations of Certified Financial PlannerTM, Certified Divorce Financial Analyst®, and Chartered Retirement Planning CounselorSM. She received a Bachelor of Science degree in Finance and Marketing from New York University's Stern School of Business and resides in North Caldwell, NJ. Janney’s Hackensack, NJ branch office is located at 505 Main St, Suite 200, Hackensack, NJ 07601.